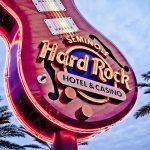 For the month of March, Seminole Hard Rock Tampa went green for the Ian Beckles Foundation! On March 27, 2015, Hard Rock Cafe hosted a charity slot tournament for the non-profit organization. The foundation, started by former Tampa Bay Buccaneer and current co-host of the Ron & Ian sports show on 620 AM WDAE, aims to equip teens in foster care with the tools to succeed before they age out of the system through education and mentorship. In addition to half of the slot tournament proceeds going to the foundation, the casino donated 100 percent of the proceeds generated from limited edition March glasses sold in the Rock Shop, as well as proceeds from sales of the 2015 Seminole Hard Rock Girls Calendar. In total, the Seminole Hard Rock fans raised $7,110 for the cause making the designated four weeks an ultimate jackpot! Following the exciting slot tournament, was a performance by Angela Rodriguez, a local Seminole High School sophomore who was a contestant in American Idol season 14. Fun Fact: The Ian Beckles Foundation became the first charity to completely sell out of the limited edition sunglasses.